Likely didn't want to get caught. Apparently the payoff for true narcissists is something called "narcissistic supply" and that can mean a lot of different things I guess. Some are attention, theft, admiration from others, feeling good they have everyone duped is a special "high", feeling like they are smarter or superior in other ways to everyone else, infantilizing others, feeling like the role of others is to admire them, serve them, prop up the nonexistent sense of self these people have, trying to accumulate "power", trying to be a "star" or to associate with "stars", trying to make sure people don't speak out, there are apparently a lot of reasons. The big thing is they aren't fixable, they can't develop a conscience and according to the page they actually have differences in their brain scans than non-narcissists do. I guess the scans show a lack of brain development in the area which regulates conscience, empathy for others and other things. Apparently they can mimic it and can mimic humble too as a manipulation to keep people involved with them but never develop it. "They are so awesome", is frequently heard by people they show their "false self" mask to, they need an audience so they have to cultivate that. To fake something and steal to boot would be quite thrilling for them as it was working, a real "high" and reinforcement to them of their sense of entitlement. Some of the more ill narcissists would do something like this and think it was ok because "people would want to glorify them." RE: Robert Young fakes run across America 6/12/2016 6:35PM - in reply to Don't come the raw prawn. "From the traditional Australian expression: "Don't come the raw prawn!" or "Don't come the raw prawn with me! ", meaning: "Don't try to put one over me!" or "Don't treat me like a fool!". Particularly used to indicate that the listener is aware of the speaker's ingenuousness, for example where the person to whom it's directed feigns innocence or naivety. Some sources say it is a WWII Australian Army expression. As to why it arose: one suggestion is that the reason lies in cooked prawn being more palatable than raw prawn. However, anyone from a fishing background who has handled raw prawn flesh, will know that it is limp, wet and slippery; like the sort of people at whom this phrase is directed." 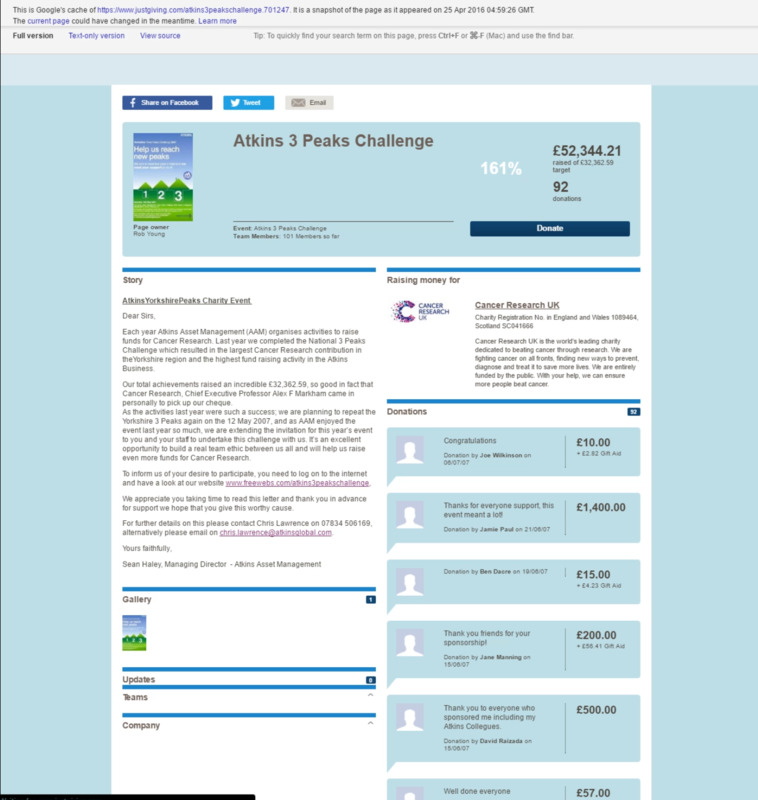 For some reason, I can't get the cached page for https://www.justgiving.com/atkins.3peakschallenge.701247 to work, but did get a screengrab just before it flicked to a white screen, which shows the page owner as a 'Rob Young'. This refers to a Three Peaks Challenge in 2007. Now, there are thousands of Rob Youngs in the UK, and I'm not sure he's ever claimed to work for / have an association with Aktins, but maybe worth digging deeper? Is there a way to post the screengrab here? So in 2004, this Hertfordshire article describes a triathlete Rob Young fundraising towards a big 12K swim and planning 2 more challenges towards charity fundraising: cycling the "three summits challenge" (Ben Nevis, Scafell, Snowden) and some big run. Here's more on the Atkins 3 Peaks Challenge (although it doesn't mention Rob Young). It's 24 miles connecting those peaks. It would be very interesting if all of this is Rob Young the marathon man. But at this point, that's unknown. But if it is, then he was certainly no coach potato when he claims to become an instant marathoner in April 2014. He would have been quite an endurance athlete (triathlons, cycling, trail-hiking). And he certainly would've already known a great deal about charity fundraising. "I will say this much. this is the absolute first mention of his charity that i have seen. "what charity is he running for, anyway?" "is he directly raising money for them?" because he sure as hell is not calling attention to them. there are people i know and respect who are still supporting him. but, all i hear is the "nice guy" defense. and, more than that, the numbers. and those numbers are simply impossible. and still log big mileage. and hard effort has physiological costs associated. he would not have the sort of times we can actually verify. he would not be finishing only around the top third of the two utras he ran. the only possible positive explanation is extremely poor data collection by his team. the logical explanation is that he was riding in the van. making those videos doubly damning. he should be glad to see team geezer. and we "think" he is genuine. we will have seen it for ourselves. certainly well over 400 for 6 days. in an uncrewed journey run. but, i saw someone speculating that he is saving his energy for "team ultra"
This story has proved that the ultra community is completely dysfunctional. . He isn't winning races of significance. His big claims come from solo project which are very hard to verify. ...here until Asher shot a video. 1) Letsrun doesn't care about ultras. 2) People at this ultralist forum where laz is coming from were already skeptical and planning their trip. He hasn't even attempted to run any real ultra races, with actually fast people. Plus, people in the ultra world probably don't even know who Jim Ryun is, or who Genzebe is. And similarly, people on letsrun don't know who Ray K is, or care. Really? You mean one world is in the Olympics on an elite stage, and one is not....because they aren't elite. Thanks for that. I only find it even more suspicious when they resort to scare tactics and diversion. If they had nothing to hide, surely they'd happily comply with the requests? Why be offended if you haven't done anything wrong? RE: Robert Young fakes run across America 6/12/2016 6:40PM - in reply to Don't come the raw prawn. So let's get this clear, ultra pvssies, especially you British twats, next time you think someone is cheating and you don't dare raise your voice, come to letsrun. Here the American Big Boys will take care of your worries, and eventually bust the cheater for you. FMD, 'ang on there fella don't come the raw prawn, you're on the World Wide Web and I'm in Australia and made my contribution to exposing this fair dinkum wombat. "Dustin here, part of Rob's crew. Either way there can be no proof of cheating or lying because there has been none"
Oh dear Dustin, you are a silly boy, obviously sent before LetsRun got involved and presented the "cheating" and "lying". Some of this sounds like sociopathy. Do you think that the flying monkey enablers could be other than BPD, and have similar personality issues? Since entering MO, averaging 46.76mpd. Using midnight to midnight ET as my â€œdayâ€. 12-Jun 30.2 current, 41.78 forecasted. Currently still at Innkeeper Motel according to tracker. Needs to average ~56.41mpd to arrive at Times Square and shave a minute off of record assuming ~210 miles to Indy and ~936mi to Times Square. First, a huge applause to the Ultra Listers for getting out there to investigate. I think the case is already closed against him, but those mileage totals by state look extremely suspect. According to his route, he crossed the Rockies in NM and went to huge elevation in AZ as well. My instinct (which could be way off) is that he'd be slowest in those states due to the climbing and elevation, even if he was fresh and wasn't battling humidity. Maybe someone on the Ultra list can chime in? In particular, in NM he had his best totals running almost entirely in the Rockies. In AZ he had to climb almost 7000 ft in 180 miles to get to flagstaff. Maybe someone with the detailed GPS data can fill in pace with approximate elevations/climbs to see if he's cranking out marathon pr's up in the mountains. "It's very serious and I will attend to it legally once this is over and done with if necessary. Legally it is defamation of character. Individuals had better have good reason to get into that or a very good lawyer and deep pockets. Either way there can be no proof of cheating or lying because there has been none." Dustin old mate, which individuals are you talking about here? Please enlighten us. Add to the climbing, the additional fact Mr. Young comes from near sea level (in comparison to AZ & CO, everything in GB is sea level). Those of us from sea level, frequently find the air a little rare at 7000 - 9000 ft.
You likely need to get out of the house more. RY's tracker is on the move again, and is about 2.8 miles east of the Innkeeper stop. I didn't see what time they departed, but it must have been about 6:30 Central time. Somebody better wake up the Ultra geezers! I think they are snoozing in the room next door! Don't come the raw prawn. No way to talk to my old Mum. It's 83 degrees there (feels like 89 degrees) according to the NWS.